Motor dealer at 34/36 Upper Green East. This entry was posted in Garages, Roads and tagged 1958, Upper Green East on November 17, 2018 by Mitcham Historian. Numbers 37 and 39, Upper Green East, is a single building with, currently in 2018, a Cost Cutter shop with flats above. The postcode is CR4 2PF. 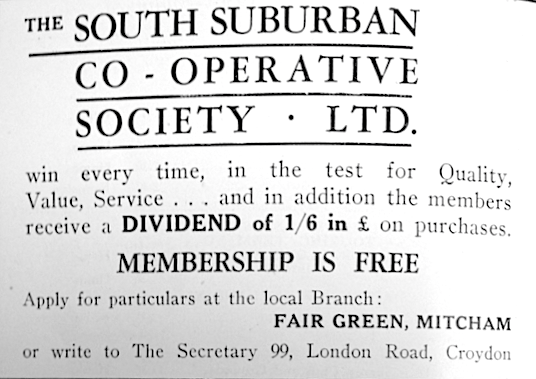 The co-op was not listed in the 1930 commercial directory, but is in the 1938 edition, with a telephone number of 3937. Maps are reproduced with the permission of the National Library of Scotland. This entry was posted in Buildings, Roads, Shops and tagged 1936, 1984, Upper Green East on November 14, 2018 by Mitcham Historian. Two identically constructed rows of shops with flats above on the south side of Upper Green East, Mitcham. All are numbered even, with the first block being numbers 2 to 16 and the second from 18 to 38, ascending to the east of the Fair Green. Postcodes are CR4 2PA for no.s 2 to 14; CR4 2PB for 14A through to 38. This birds-eye view from Bing shows that each pair of properties forms a ‘T’ shape, with the top of the T facing the street. 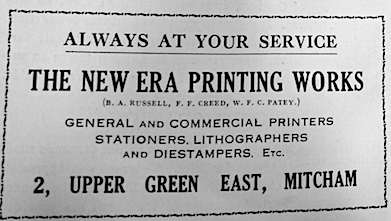 These blocks were probably built in the late 1920s as there is no mention of this part of Upper Green East in the 1925 street directory, and these ads appear in the 1929 town guide. This entry was posted in Housing, Roads, Shops and tagged 1929, Upper Green East on October 3, 2018 by Mitcham Historian. 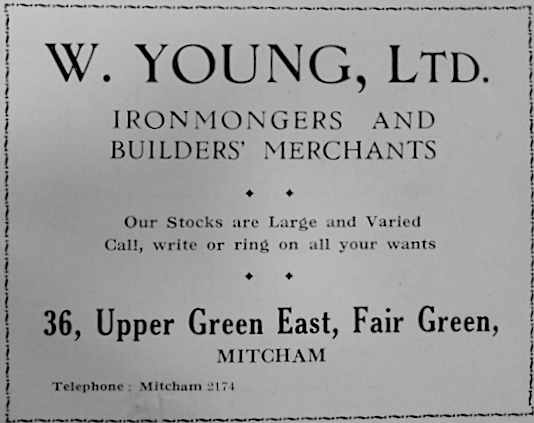 Closed on 4th March 1978 after being in business for 80 years, according to Merton Memories. 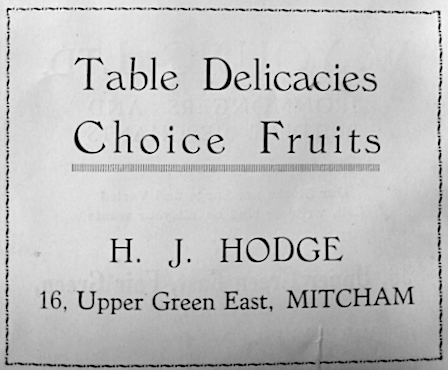 This entry was posted in Roads, Shops and tagged 1930, 1954, 1978, Davis, greengrocer, Upper Green East on March 1, 2018 by Mitcham Historian. 1987 clip from Merton Memories photo 34889, copyright London Borough of Merton. This entry was posted in Roads, Shops and tagged 1986, Upper Green East on July 20, 2017 by Mitcham Historian. Sport Jackets = Smartly tailored in Single or Double Breasted styles. Sports Trousers = Gaberdine or worsted in attractive new shades. Suits = To suit all occasions. Expertly cut and tailored. Raincoats = In cotton or wool Gaberdine. Shirts & Ties = In modern and traditional styles. This entry was posted in Roads, Shops and tagged 1972, Fair Green, Upper Green East on January 11, 2017 by Mitcham Historian. Road off of northern side of Upper Green East. In the 1911 commercial directory, Hermann John Schneider, is listed as turncock to the Metropolitan Water Board, at 2 Clarendon Grove, Upper Mitcham. In 1938, in a report of the death of Mrs Schneider at the same address, Mr H.J. Schneider was said to have also been in the Mitcham Fire Brigade. The funeral took place at Mitcham Old Graveyard on Friday of Mrs. Mary Grace Schneider, aged 81, wife of Mr. H. J. Schneider, of Clarendon-grove, Mitcham Fair Green. She died at the home of her youngest son, Mr. C. F. Schneider, Girtongardens. Shirley. The old lady, with her husband, was looking forward to calibrating their diamond wedding on November 14th next. Mr Schneider, who will be 84 next month, was a turncock for the Metropolitan Water Board in Tooting and Mitcham for many years. He was also a member of Mitcham fire brigade for a long period. This entry was posted in Roads and tagged 1910, 1911, 1915, 1938, 1953, Clarendon Grove, Metropolitan Water Board, tunrcock, Upper Green East on November 13, 2016 by Mitcham Historian.